Custom black licorice lip shimmer w /white tube cap is a gorgeous lip shimmer with typical American taste. Licorice candies are childhood treats enjoyed by kids all over America and their fascination with it often continues in adulthood, too. Black licorice lip shimmer ignites this toffee fixation and silkifies their lip skin. This shimmery lip balm offers soft, supple and healthy texture to the lips. Health Quotient – PABA Free. Formulated with natural ingredients such as light mineral oil, vitamin E, coconut oil, beeswax, aloe oil, and skin conditioning agents. Black licorice flavor. Cruelty- free. Harsh flavoring agents and perfumes avoided. Directions – Rub black licorice balm over bare lips or use it as an add-on with your lip make up. Avoid rubbing it over eyes or cheeks as moisturizer. 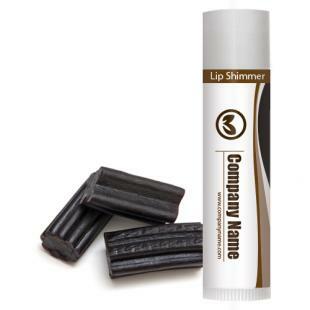 Gifting Favors – Custom black licorice lip shimmer w/white tube cap can be gifted during birthday parties, anniversary parties or any reunion. It also makes a very cherishing wedding favor.